Does Cintas Corporation (NASDAQ:CTAS) represent a good buying opportunity at the moment? Let’s briefly check the hedge fund interest towards the company. Hedge fund firms constantly search out bright intellectuals and highly-experienced employees and throw away millions of dollars on satellite photos and other research activities, so it is no wonder why they tend to generate millions in profits each year. It is also true that some hedge fund players fail inconceivably on some occasions, but net net their stock picks have been generating superior risk-adjusted returns on average over the years. 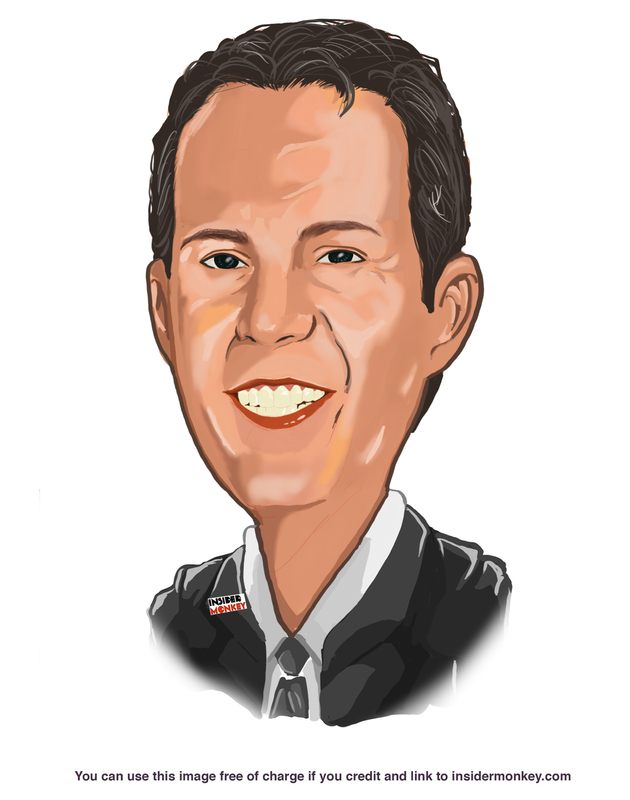 Is Cintas Corporation (NASDAQ:CTAS) worth your attention right now? The best stock pickers are in a bearish mood. The number of bullish hedge fund bets fell by 2 lately. Our calculations also showed that CTAS isn’t among the 30 most popular stocks among hedge funds. Let’s view the new hedge fund action regarding Cintas Corporation (NASDAQ:CTAS). At Q4’s end, a total of 29 of the hedge funds tracked by Insider Monkey were bullish on this stock, a change of -6% from the second quarter of 2018. 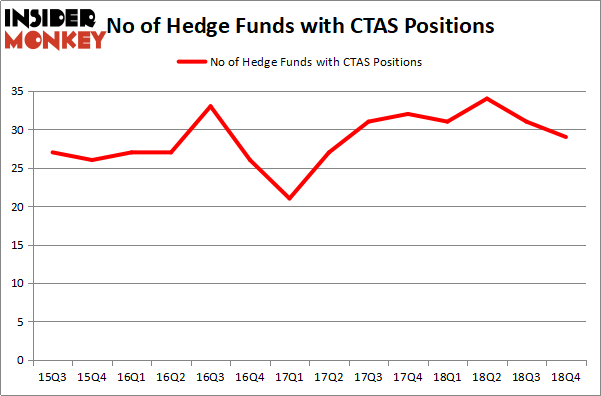 The graph below displays the number of hedge funds with bullish position in CTAS over the last 14 quarters. So, let’s see which hedge funds were among the top holders of the stock and which hedge funds were making big moves. The largest stake in Cintas Corporation (NASDAQ:CTAS) was held by Select Equity Group, which reported holding $129.6 million worth of stock at the end of September. It was followed by AQR Capital Management with a $74.2 million position. Other investors bullish on the company included Chilton Investment Company, Renaissance Technologies, and Alkeon Capital Management. Because Cintas Corporation (NASDAQ:CTAS) has faced bearish sentiment from the smart money, logic holds that there lies a certain “tier” of fund managers who sold off their entire stakes heading into Q3. At the top of the heap, John Armitage’s Egerton Capital Limited dumped the biggest investment of the 700 funds watched by Insider Monkey, comprising about $128.2 million in stock, and Pasco Alfaro / Richard Tumure’s Miura Global Management was right behind this move, as the fund said goodbye to about $27.7 million worth. These moves are intriguing to say the least, as total hedge fund interest dropped by 2 funds heading into Q3. Let’s go over hedge fund activity in other stocks similar to Cintas Corporation (NASDAQ:CTAS). We will take a look at Credicorp Ltd. (NYSE:BAP), POSCO (NYSE:PKX), Cheniere Energy Partners LP (NYSEAMEX:CQP), and Boston Properties, Inc. (NYSE:BXP). All of these stocks’ market caps match CTAS’s market cap. As you can see these stocks had an average of 12.5 hedge funds with bullish positions and the average amount invested in these stocks was $317 million. That figure was $692 million in CTAS’s case. Boston Properties, Inc. (NYSE:BXP) is the most popular stock in this table. On the other hand Cheniere Energy Partners LP (NYSEAMEX:CQP) is the least popular one with only 4 bullish hedge fund positions. Compared to these stocks Cintas Corporation (NASDAQ:CTAS) is more popular among hedge funds. Our calculations showed that top 15 most popular stocks among hedge funds returned 19.7% through March 15th and outperformed the S&P 500 ETF (SPY) by 6.6 percentage points. Hedge funds were also right about betting on CTAS as the stock returned 22.4% and outperformed the market as well.